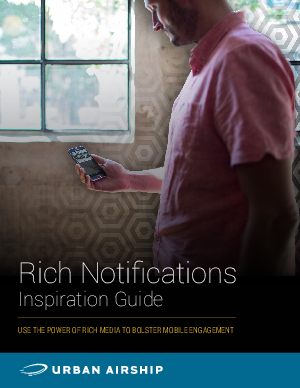 Rich Notifications give marketers and mobile leaders the ability to engage their customers more deeply by including photos, videos, GIFs and even audio — right on a user’s lockscreen. August 2016 research shows Rich Notifications that include pictures see a 56% higher direct open rate on average than notifications without images. We created this Inspiration Guide to help you envision new possibilities and quickly understand how to implement Rich Notifications with Urban Airship Engage for smarter, more responsive campaigns that lead to better user experiences.